A Plethora Of Pictures? A vast variety of videos? A cornucopia of clip art? Or maybe I should just say, an inundation of images! If you need photos, illustrations, clip art, even videos for your project, Pixabay.com probably has everything you need! Even better, all the images on the site are released into the Public Domain (Pixabay license). That means you can use materials from Pixabay as backgrounds or paste them as clip art, modify them, combine them as components in a design, even use them for a commercial project, and you aren’t required to pay for use or include attribution. However, they do appreciate a link back to pixabay.com, and personally I think it’s kind to include an attribution notice. I stumbled on this site while looking for photos to use for the story of the cranky golf ball. I was delighted with the enormous photo collection and its excellent quality, and amazed to find that images are FREE to download. 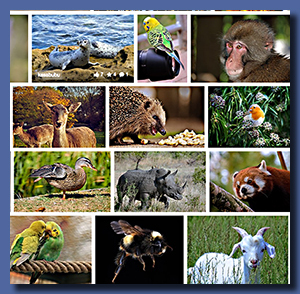 My example here is cropped out of the screen of thumbnails I got by searching the Photos section for Animals. All beautiful, and all licensed Public Domain. One more plus: You always feel comfortable letting students use the site, because Pixabay provides the Safe Search filter, to exclude adult content. Even if Safe Search isn’t turned on, adult content is blacked out and clearly marked. Whether you need an account depends on what size images you require. It’s easy to sign up for a free account, but even without one, you are allowed to download fairly large images. Each photo comes in several sizes, and for many of them the original size is designated extra large. The size they usually label large is 1920 pixels wide, and you can download it without an account. It’s definitely suitable for a full page background! Certainly the small (640 wide) or medium (1280 wide) sizes of most photos, which anyone can download, are big enough for most uses. Illustration For A Book Fair? If you want to crop out a very small element of a photo, for example a tiny ant, you might need to start with an even bigger image. The extra large size, usually the original photo, ranges from 2700 pixels to a huge 5000 pixels wide, for the few I inspected. If you crop out an image of an ant from a 5000 pixels wide photo, it’s probably big enough to fill an entire page! You must sign up for a free account to download the original, extra large images, but they’re still free to use and, of course, licensed Public Domain. Wow! Look At Those Videos! Realizing what an outstanding photo collection Pixabay has, I also looked at their Illustrations and Videos sections. Yes, you really can download free short videos on a variety of topics, ranging from a moving escalator to beautiful moving abstracts to use as backgrounds with speech or music. The video of the clock you see on this page is just one of many striking examples! This video downloaded in mp4 format, and it opened in both Windows Media Player® and QuickTime®. 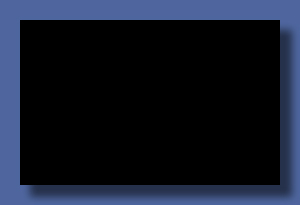 Pixabay also supplies embed code free, in case you want to put the video onto a web page. Contact me for how to get it to have a drop shadow. But that’s not all! 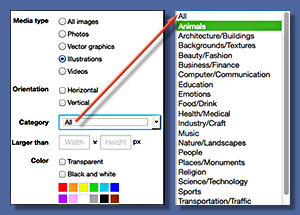 An enormous section of Pixabay labeled as Illustrations includes clip art and much more. 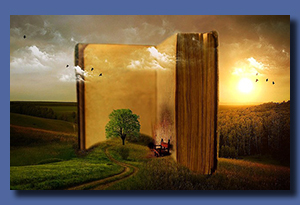 Art in many different media illustrate specific topics, such as the two examples here, a lovely background depicting music and a whimsical scene with a giant book. Can’t you see that book scene with some text about a BIG book sale or promoting summer reading? Some of the items in Illustrations are photos, or a montage of photos. 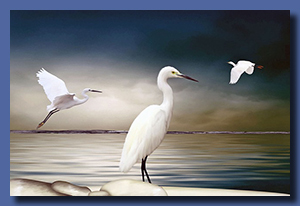 Isn’t the photo montage of white ibises exquisite? It’s also factual, and could easily be used in a science report or lesson. Finally, this section also has tons of excellent quality clip art. I particularly liked an extensive set of very lively emoticons that could be used in many different types of activities. With over 1,500,000 images, and over 8,500 videos, Pixabay could be too much of a good thing. Fortunately, there is a set of search filters to quickly zero in on exactly what you need. From the home page, click the green Search button. At the top of the next page, you’ll see a row of options. They let you specify what type of media you’re seeking, orientation (vertical or horizontal), the minimum size in pixels, and even the color scheme. You also can pick a category, then type in a specific item from that category to search for. This filter system is easy enough for students to navigate. If you need a more specific search, take a look at the Advanced Search page for information on how to do a combined search, search using the photographer name, exclude certain words, and more. So that you won’t have to pick through the techie jungle, I’ve put links to three wonderful sets of wallpaper images and an online make-an-advent-calender activity at the foot of this page. Still, it may be worth scrolling past those nerd toys to download one of several Pixabay apps, and get one-click (or tap) access to the Pixabay site from Google Chrome and Google Docs, Mac desktop, Android, iOS (iPhone and iPad), or NotePad++. There also is a collection of Freebies from Pixabay blog posts that I haven’t explored thoroughly. There are overlaps with the Goodies page and some of these offers may be out of date but it’s well worth investigating. Pixabay was founded by two young German men, and I am astounded at their generosity in setting up this site and keeping the quality so high. When you see this resource, you’ll want to send your thanks to everyone on the team that tends and edits Pixabay and especially to the many generous photographers who share their wonderful work here. These treasures only await the addition of your ideas to become activities that delight your classes. PIXABAY link Click Here. 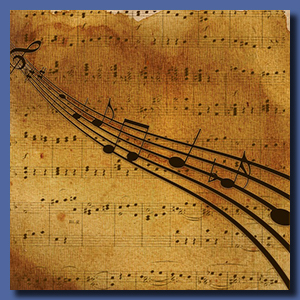 Resource site for photos, illustrations, clip art, and videos licensed as Public Domain. Pixabay Wallpaper Collection: Information, examples, and download link here. Pixabay’s first collection of stunning desktop backgrounds. A set of over 40 high resolution (4K and 5K UltraHD) pictures of various topics. Christmas Wallpaper Collection: Information, examples, and download link here. A bundle of outstanding and useful hi-res photos and art illustrations about Christmas. Easter Wallpaper Collection: Information, examples, and download link here. A bundle of outstanding and useful hi-res photos and art illustrations about Easter. AdventMyFriend: Information, examples, and download link here. A free website for creating and sharing customized online advent calendars.